A prop E-11 blaster rifle based from Sterling Gun, as used by Imperial stormtroopers. 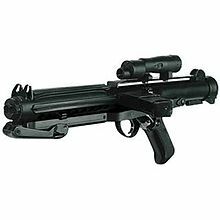 A blaster is a fictional gun that appears in the Star Wars universe. Lucasfilm defines the blaster as "ranged energized particle weaponry". Many blasters mirror the appearance, functions, components, operation, and usage of real life firearms. They are also said to be able to be modified with certain add-ons and attachments, with Han Solo's blaster being said to be illegally modified to provide greater damage without increasing power consumption. The design of the traditional stormtrooper blaster is based on the real-life Sterling sub-machine gun used by the armed forces of the United Kingdom over the second half of the 20th century, with changes made by the filmmakers such as alterations to the magazine. In the films, the design of the E-11 blaster rifle was based on the Sterling submachine gun. The design of the modified DL-44 blaster pistol owned by the fictional character Han Solo was based on the 7.63-caliber Mauser C96, an early and successful automatic pistol that was used in World War I and World War II. Lucasfilm's prop department added a scope and an emitter nozzle to the pistol. The blaster made for the 1977 film A New Hope was lost, and a second blaster was made with resin from the cast used for the first one. The blaster was subsequently used as a prop in The Empire Strikes Back and Return of the Jedi. Functional Sterlings firing blank cartridges were used in some scenes with the laser bolt added later in post-production. These blank cartridges are responsible for the muzzle flash seen on screen and, in some scenes, the cartridges themselves can be seen being ejected from the guns, or the actual sound of the blank cartridge is not dubbed over by a sound effect. Ben Burtt, a sound designer who worked on the Star Wars films, came up with the sound of blaster fire during a family backpacking trip in the Pocono Mountains in 1976. Burtt hit the guy-wire of an AM radio transmitter tower with a hammer and recorded the sound with a microphone close to the impact. In a chapter of the book Myth, Media, and Culture in Star Wars, Michael Kaminski, writing about the influence of Japanese director Akira Kurosawa on the Star Wars films, said that Kurosawa's Ran influenced the exchange of blaster fire. Like in Ran, color-coding and an "onscreen sense of direction" of blaster fire are used to depict opposing forces. In the Star Wars original trilogy, rebels employed red blaster fire and often attacked from the left, while the Empire employed green blaster fire and attacked from the right. In Star Wars: Episode II – Attack of the Clones, the second film of the prequel trilogy, the color and the direction were reversed. In that film, the Republic employed green and blue blaster fire and attacked from the right, while the Separatists employed red blaster fire and attacked from the left. The inner workings of blasters essentially create particle beams to inflict damage. When the trigger is pulled, the blaster chambers a small volume of the fictional Tibanna gas into a gas conversion enabler (or XCiter). The XCiter excites the gas particles with energy from a power-pack, which attaches to the weapon much like a magazine does to real world weapons. Afterwards, the excited gas is compressed into a beam in the actuating blaster module before being focused by first a prismatic crystal and then the galven circuitry in the barrel of the weapon. One prop of Han Solo's blaster was expected to sell at auction for US $200,000–300,000, and another for $500,000. ^ "Star Wars Episode IV: A New Hope". Movie Prop Collecting with Jason DeBord's Original Prop Blog Film & TV Prop, Costume, Hollywood Memorablia Pop Culture Resource. ^ Henderson, Mary (1997). Star Wars: The Magic of Myth. Spectra. pp. 167, 170. ISBN 978-0-553-37810-8. ^ Child, Ben (December 2, 2013). "Star Wars: Han Solo's blaster to sell at auction". The Guardian. ^ Rinzler, J. W. (2010). The Sounds of Star Wars. Chronicle Books. p. 54. ISBN 978-0-8118-7546-2. ^ Whittington, William (2007). Sound Design and Science Fiction. University of Texas Press. ISBN 978-0-292-71431-1. ^ Kaminski, Michael (2012). "Under the Influence of Akira Kurosawa: The Visual Style of George Lucas". In Brode, Michael; Deyneka, Leah (eds.). Myth, Media, and Culture in Star Wars: An Anthology. Scarecrow Press. p. 97. ISBN 978-0-8108-8512-7. ^ Smith, Bill (1998). Star Wars: The Essential Guide to Weapons and Technology. London: Boxtree. pp. 4, 6. ISBN 0 7522 2338 0. ^ McMillan, Graeme. "Here's Your Chance to Own Han Solo's Blaster – For $300K". Wired. Condé Nast. Retrieved December 2, 2013. ^ Muncy, Julie (April 28, 2018). "Hokey Religion is No Match For This Authentic Han Solo Blaster Auction, Kid". io9. Univision Communications. Retrieved April 28, 2018.